It is said that the birthplace of the out-of-town mall was in Grandview Heights, Ohio, USA in 1928 with the opening of Grandview Avenue Shopping Center, designed by Don Monroe Casto Sr. It was revolutionary in the fact that it incorporated parking into the design, creating potential for developing large scale shopping opportunities away from the traditional urban core. Studies were conducted into how customers may be enticed in a controlled environment and as a result, the shopping centre included innovations like inward facing stores and the concept of anchor tenants alongside smaller scale chain stores. In 1954, accelerated depreciation laws were changed to encourage development on the urban fringe prompting further mall development. REITs, or Real Estate Investment Trusts, allowing groups of investors to avoid corporate income tax further helped the development of shopping malls. 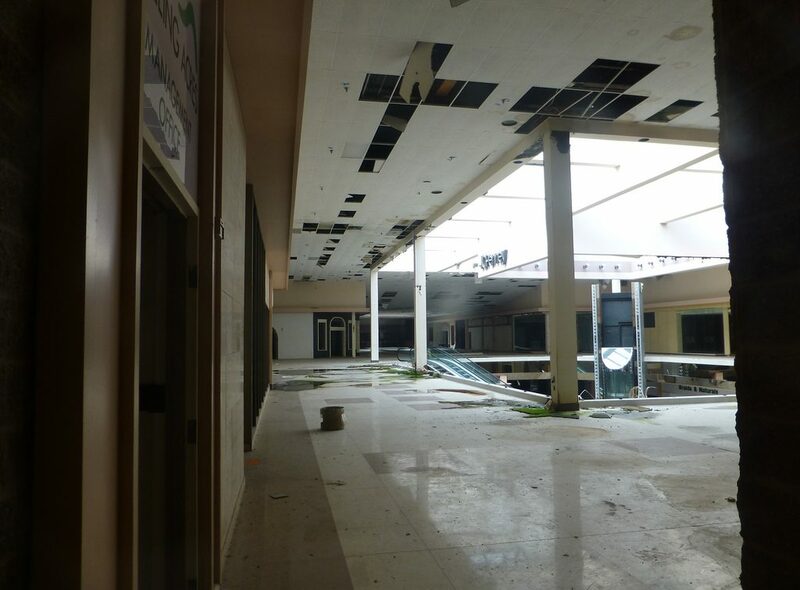 One such out-of-town shopping centre was Rolling Acres Mall in Akron in Ohio, the state which saw the true birth of the shopping mall. Plans were mooted in the 1960s about developing the Rolling Acres area of the city but it wasn’t until the early 1970s that agreement was reached on the proposal presented by Forest City Enterprises and construction began. 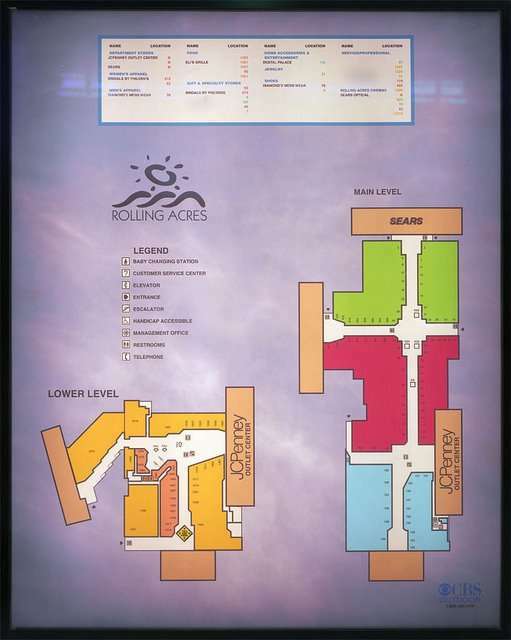 Rolling Acres Mall opened on 6 August 1975 with Sears as an anchor and 21 smaller stores. By the end of the year, this number had grown to 50 stores. Within a few months, JCPenney opened a second anchor store and in 1977, an extension added the Court of Aquarius, bringing Montgomery Ward as an anchor tenant alongside a short lived aquarium. The rapid expansion continued into 1978 when The Promenade opened, a two storey wing which included a food court and Ohio chain O’Neils as an anchor. Rolling Acres Mall remained popular throughout the eighties. A renovation in 1986 saw the structure freshened up, while Higbee’s replaced Montgomery Ward. O’Neil’s was rebranded to May Company Ohio following a merger in 1989. Neither lasted long and they were replaced by Dillard’s and Kaufmann’s respectively in the early 1990s. This was, however, the beginning of the mall’s decline. The cinema closed in 1993 and in an effort to improve fortunes, Forest City Enterprises sought additional finance to redevelop the food court and develop a fifth anchor store for Target which opened in 1995. It did little to reverse the decline though, and a number of stores began to leave the mall. Additional competition from Summit Mall meant Rolling Acres Mall struggled to maintain footfall and both Dillard’s and JCPenney were downgraded to outlets. In 2000, Banking Trust of New York bought the mall and attempted to reverse its fortunes. The cinema reopened and there were noticeable improvements in operations and maintenance but just over a year later, it was sold again to the Whichard Family for $2.75 million, a lot less than the $33.5 million that Bankers Trust of New York had paid for it. The new owners, with a reputation for reestablishing failing malls, struggled to attract new stores. Target left in 2006 and Dillard’s followed a few months later. The Dillard’s store front has seen better days. It had been abandoned for a number of years when this was taken. Invest Commercial LLC purchased the property in 2006 and saw Kauffman’s rebranded as Macy’s however this only lasted for a number of months before closing too. 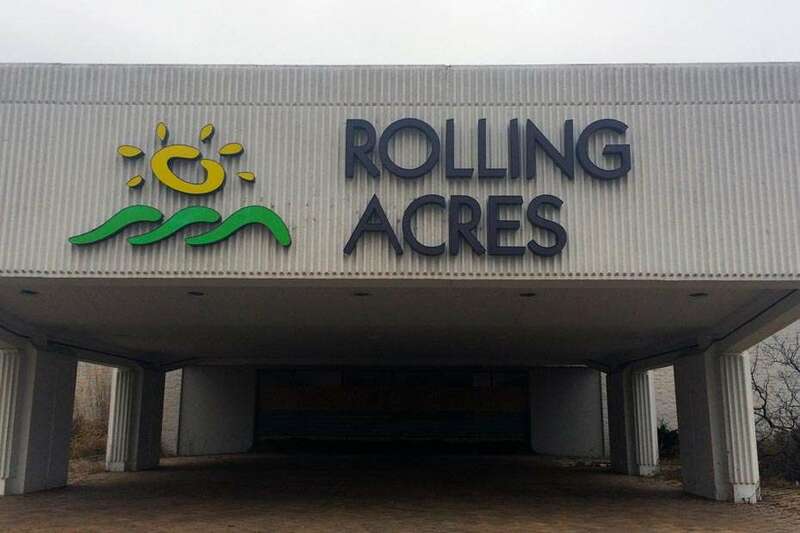 The writing seemed to be on the wall and in 2008, with only 8 stores remaining, the owner announced that Rolling Acres Mall would be closing for good on October 31st. The mall was sold again, this time to Premier Ventures LLC and Sears and JC Penney continued to operate from external entrances but by 2011, Sears was gone and JCPenney followed in 2013, leaving the mall abandoned. A Storage Of America outlet operated for a time in the former Target store and a recycling facility took over the former Sears site but neither lasted long. Premier Ventures found themselves in financial difficulty and efforts were made to sell the property and so ownership transferred to the City of Akron, with the exception of the anchor store buildings. JCPenney agreed to give their building to the city and deals were made with the remaining owners. By August 2017, Rolling Acres Mall had been demolished. The cinema at Rolling Acres Mall went through several iterations including once being called Blind Squirrel Cinema and spending time as a discount theater. A lot of the fixtures and fittings were removed from inside the mall, leaving quite a bare structure.